Food and nutrition are essential in everybody’s life, but at the same time there is very little knowledge about it. In modern societies people go shopping in supermarkets, they have dinner in restaurants and use industrial food on a large scale. This is a very recent development. In the past everybody had to spend a lot of time growing, preparing and preserving food. The necessary techniques were well known and food was considered very valuable also due to its rareness during certain periods, e.g. winter time. 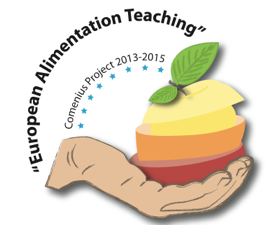 The project “European Alimentary Teaching” aims to improve awareness on today’s food production ecological and ethical alternatives. We will focus on food traditions in the different countries and regions today and in past times. An awareness on the kind of food and its nutritious values we consume will also give our students knowledge of a healthy diet. 1. Show our students that an improved diet will positively affect their mental and physical performance. 3. Show how and where our food is produced and what impact it has on the environment, the economy and the culture both at local, national and European level. • Investigating (e.g. with the help of grandparents) changes in food tradition, making menus of traditional and modern dishes in order to improve awareness of the problem of wasting food. • Analysing where our food comes from, how it is produced and what impact it has on our economy and environment. Le résultat des travaux des élèves est consultable sur le Wikispace du projet en cliquant ici. Il est mis à jour au fur et à mesure de l'avancée du projet.